HobNob’s name implies getting together, socializing, and even the clinking of glasses, drinking together. A New World style of wine that is evenly balanced, fruit forward, with a rich mouthfeel and hints of oak. 5 popular varietals – Pinot Noir, California Chardonnay, Merlot, Red Blend and Cabernet Sauvignon. Eye catching packaging, color coordinated by varietal strongly resonates with younger, more visually oriented wine buyers and consumers. 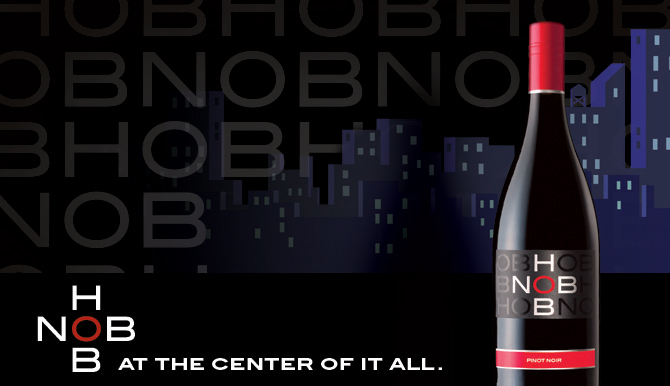 HobNob wines are approachable, inspirational, contemporary, sophisticated yet casual, fun and clever. HobNob’s digital hub on facebook (facebook.com/hobnobwines) is a popular, interactive social networking site for HobNob’s customer base of in-the-know Millennials. Contemporary, fruit-forward premium wine that personifies “social style” for around $10.